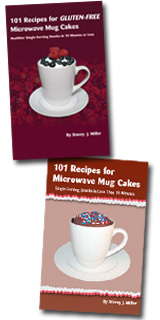 Where Did 101 Recipes for Microwave Mug Cakes Come From? Why did a book publicist write a recipe book for microwave mug cakes? Well, home office-based book publicists get hungry, too, and even those with tremendous self-discipline and willpower sometimes need something incredibly delicious. So one day, when I saw a recipe for a single-serving chocolate mug cake that you could bake in your microwave oven, I caved in and gave it a try (during my lunchtime, naturally). It hit the spot. Hands down, the chocolate mug cake recipe I’d seen floating around the Internet (and that I’d received in my email box at least a dozen times) beat baking a whole pan of brownies that I’d either spend the rest of the week trying to ignore or, worse still, wouldn’t ignore. It beat finding a recipe, whipping out the electric mixer and the mixing bowl, hunting down the right ingredients and a brownie pan, heating up the entire kitchen — this was on a hot day in the New England summertime — and waiting about an hour to make, bake, and cool the brownies so that I could eat one. The chocolate mug cake was perfect except for one minor detail: that’s all there was. Seriously. I scoured the Internet in search of other microwave mug cake recipes, but all I could find was that chocolate mug cake recipe (which seems to have morphed into at least half a dozen versions, not all of which worked for me). You can find everything on the Internet, I reasoned. Surely, fans of the chocolate mug cake recipe must have come up with their own microwave mug cakes. I even did the obvious — I typed www.microwavemugcakes.com into my browser – and I came up dry. No one seemed to have created microwave mug cake recipes that I could try to satisfy my need for a quick, satisfying single-serving treat. Everyone in Cyberspace apparently agreed to leave that one mug cake recipe, and its permutations, stand on its own, and languish out there in isolation and relative obscurity. That seemed like a miscarriage of baked-goods justice to me, so I determined, then and there, that I would create 101 Recipes for Microwave Mug Cakes, and I’d self-publish it so that the book could reach the bookshelves before Web surfers forgot about the chocolate mug cake recipe they’d enjoyed (and passed on to everyone whose email address they had). And that’s what I did. 101 Recipes for Microwave Mug Cakes wasn’t an easy book to create given the fact that, for every new ingredient I introduced, my microwave oven had an unexpected reaction. Did I want to use fruit juice in one of my microwave mug cakes? Did I want to add miniature marshmallows to a recipe? Did I want to leave out the baking powder? Did I want to try an egg substitute? Did I have a hankering to add some powdered drink mix? Finally, the turntable on my microwave oven stopped turning for awhile, and the light bulb in my microwave oven darkened in protest. Intrepid book publicist, handy person, and baker that I am, I fixed the turntable and the light bulb, wiped out the messes that exploding microwave mug cakes had caused in the microwave oven, and restored my microwave oven to pristine condition. I was left with 101 Recipes for Microwave Mug Cakes that work — if you follow the directions, and if you observe the basic safety rules for using any microwave oven. My microwave oven suffered so that yours won’t have to. And now you don’t have to experience the frustration that I felt when I learned that the chocolate mug cake recipe floating around the Internet was all there was. There’s more now. There are 101 additional recipes for microwave mug cakes that you can enjoy — in ten minutes or less. Invite your friends to enjoy their own microwave mug cakes, but don’t bake one for them. Let them discover the joy of baking quick, single-serving desserts for themselves. And feel free to eat your microwave mug cake without guilt. After all, how often do you do something terrific for yourself that’s inexpensive, legal, fun, and doesn’t even require cleanup? This entry was posted on Wednesday, September 16th, 2009 at 8:42 am	and is filed under Uncategorized. You can follow any responses to this entry through the RSS 2.0 feed. You can leave a response, or trackback from your own site. Do you have any recipes for gluten free folks like me in your book? I hate to invest in books that don’t work for me. Please keep checking this blog. I’m working on gluten free recipes, and I hope to have a sampling of them available in the weeks to come. I loved seeing you on Rachel Ray and you’ve inspiried me. I have a great idea for a cookbook, but I thought it would be too difficult to publish. After hearing you story, I’m curious if you could offer any insight to an enxpensive way to publish. Sue, please email me at stacey@microwavemugcakes.com. I’d be glad to provide guidance, if I can. This is a great idea for christmas gifts! Cute mug, dry ingredients in a plastic pouch and a lil recipe card for the receiver to mix in the rest of the ‘wet’ ingredients! A play on the brownies or cookies in a jar! Awesome, thanks for the easy and inexpensive gift idea for me as I’m unemployed and finances are tight! My hubby is diabetic. Have you experimented with sugar free recipes? Not yet, but I’m very sensitive about those who have special dietary needs, and sugar free recipes are on my list of things to create. Best of luck to your husband. Thank you. Looking forward to some recipes that he can have too. I love this idea. It helps dieters like myself not to over-indulge on such good treats. Are any or all of these recipes lowfat-low in calories? Does your book state the nutritional info for each recipe? I love sweets n’ treats. These were an awesome idea. I had never thought about making these before I stumbled upon this site! Hi Stacy, I enjoyed seeing you on Rachel Ray and my husband tracked down your book for my birthday. It is handy because he is diabetic and shouldn’t eat the sweets and I can but don’t want to bake whole cakes just for me. However, it would be helpful if you listed the power of your microwave oven you used for testing. My son recently replaced my microwave and it is twice the power of my old one! Drives me nuts, as it is so easy to turn perfectly good food into bricks and hocky pucks. So the first cake I baked in your book was nearly a cylindrical brick. (I ate it anyway) I’ve since tried again and need only 1/2 the time your recipes give as a guide. I did send out mugs with a couple premeasured treats to several friends for Christmas this year, but that was before I got your book, so they had to settle for the basic chocolate cake and chocolate pudding, but since they are my chocoholic friends it didn’t matter. I look foreward to seeing recipes for single servings for people wanting less sugar.